A frightened, unidentified woman tells the jury how she was abducted and beaten eight months ago. OAKLAND — The woman who police say was kidnapped and tortured by a group of Your Black Muslim Bakery members sat hunched over with a hat on her head Thursday as she described in court how she was abducted from her car and beaten eight months ago. With the bakery members and their attorneys occupying both the defense table and half of the jury box, the woman tried to avoid eye contact with her accused assailants as she talked of the pain she endured in a house on Avenal Street, then owned by a bakery associate. “I thought I got shot in the head and was still alive,” she said of the pain she suffered after being hit in the head. “I was told that I was going to the top of the hill, and I know what happens up there. “I was going to die,” she continued. The woman, whose name was kept secret to protect her from retribution, choked up with tears during her testimony Thursday. As she spoke, the five members of the bakery charged in the case sat quietly, sometimes talking with each other and at other times making hand signals to family members in the gallery. The woman took the stand in the first day of a preliminary hearing that will determine if prosecutors have enough evidence against the five bakery members to proceed to trial. 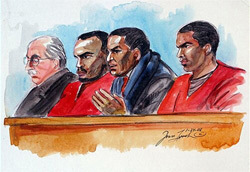 The five — bakery leader Yusuf Bey IV; his brothers Yusuf Bey V, Joshua Bey; and two other bakery members, Richard Lewis and Tamon Halfin — are all accused of a number of felony crimes related to the case, including kidnapping and torture. Police say the members hatched a plan to kidnap the woman and her mother because they believed the two knew someone who had a stash of money. The woman, who was led into the courtroom through a back hallway by a security detail of two plainclothes officers, described how she ended up in a room handcuffed with a garbage bag over her head. She said she could not identify any of the bakery members because she did not see them. She only heard two voices throughout the ordeal but knew there were more people around, she said in court. Police have linked the crime to bakery members through several pieces of evidence, including a cell phone left at the scene and two cars left at the scene owned by Yusuf Ali Bey and Ameena Bey. The woman and her mother had just left a bingo parlor on Foothill Boulevard and were driving on Interstate 580 when it appeared an undercover police cruiser was trying to pull them over. But within minutes, she said, she realized it wasn’t the police. A man walked up to the side of her car with a ski mask on and a “long gun” in his hand. He opened the door and told her to get out. “I thought about running into the freeway traffic, but my mom was with me, so I didn’t do that,” the woman said. Instead, she followed orders and went to the fake police cruiser and sat in the back seat. There, she said, a plastic garbage bag was placed over her head and metal handcuffs were put on her wrists. The car was crowded, she said. There was a driver and a front-seat passenger, and sandwiched between her and her mother in the back seat was someone else, she said. “I couldn’t breathe good because I have asthma. I said I couldn’t breathe good, and someone put a hole in the bag where my mouth was,” she said. After about five minutes, the car stopped and she was escorted from the vehicle and into a room. “Watch your step,” she said she was told as someone took her inside. Once she was inside, the torture began. She was asked for money and then asked for Tim’s money, she said. She said she didn’t know and was hit in the head. “Something hit real hard. It made my head bleed,” she said. “I thought I was shot. I felt the blood. After a little while, she said, she heard a window break and someone shout. Then there was silence. It was at that point a patrol officer happened to drive by and saw the fake police cruiser parked in the driveway. As he approached the house, everyone inside took off running, and the officer, who will testify next week when the preliminary trial continues, heard the woman’s screams, court documents state. The woman said the incident left her with visible scars on her face and hands. She also has headaches, which she never had before the beating.